Paektu volcano, on the border between the Democratic People’s Republic of Korea and China, had its most recent eruption circa 946. Dubbed “the Millennium Eruption,” this event covered the entire Korean peninsula in ash. The big question is when this active volcano will erupt again. ASU’s School of Earth and Space Exploration postdoc Kayla Iacovino (pictured above), along with scientists from North Korea and the United Kingdom, joined forces — and navigated miles of political red tape — to study this volcano and determine what potential impacts it could have when it erupts again. Their findings were recently published in Science Advances. “Doing research in this area has its challenges,” Iacovino said. To start, it’s against the law for North Korean people to speak with foreigners. In addition, international sanctions prevent most people from visiting North Korea, let alone bringing scientific equipment. The team persevered, however, for two years, navigating embassies, forms and permissions from foreign governments. The work paid off in 2013 when the UK/U.S. team was able to not only set foot in North Korea, but to work directly with local North Korean scientists. Paektu volcano is well known to North Koreans and is important to their culture, appearing on paintings and Korean money like this 50-won note. The North Korean scientific community is well aware of the dangers of such a large active volcano and has been studying the area for decades — and for good reason. A large eruption from a volcano like Paektu, while rare in human history, can cause massive damage to lives and property. The ash it spreads can affect global trade routes, crop yields, climate change and the spread of infectious diseases. Iacovino, who is both a volcanologist and petrologist, was able to specifically contribute to the team through her expertise in studying the origins of volcanic rocks. As a petrologist, Iacovino takes rocks that she finds in the field and recreates “mini-magma chambers” in the lab, essentially recreating the conditions of heat and pressure that originally formed the volcanic rocks. This helps provide clues to the history of the volcano, helping to predict future behavior. Iacovino and the international team also found evidence of partial melt beneath the volcano, also published in Science Advances in April 2016. They used seismometers to image the subsurface beneath Paektu and were able to locate a region of magma storage, which is likely the same magma chamber that was the source region for the erupted material during the Millennium Eruption. Kayla Iacovino, who is also an ASU alum (geology, 2010), is a postdoctoral researcher in the EPIC lab, run by SESE assistant professor Christy Till. Iacovino is featured here with the EPIC lab’s end-loaded piston cylinder. The next step for the team is to rally for new funding for ongoing science collaboration on the volcano. Another big goal is to have science teams from China and North Korea communicate with each other and, ultimately, get all the various analyses of the volcano working in tandem. By collectively monitoring and surveying ongoing changes at this active volcano, the team hopes to have a better understanding of when it may erupt again. 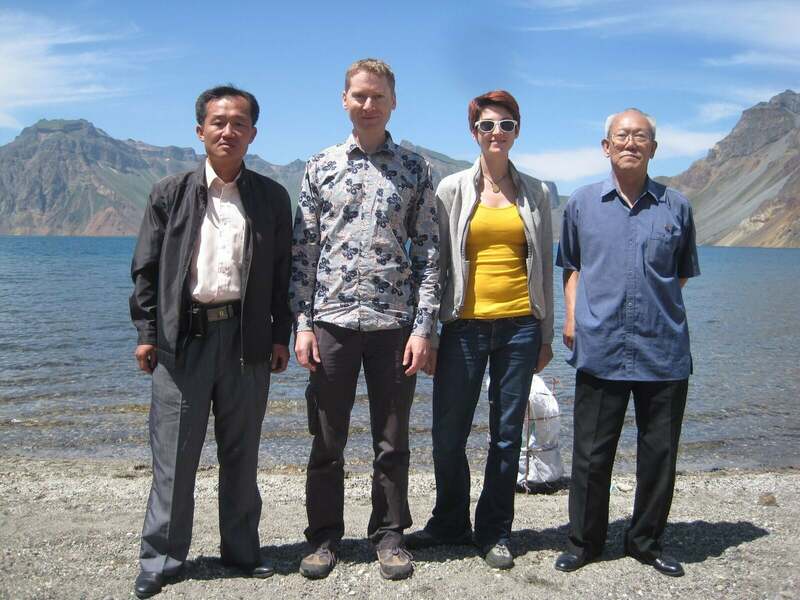 Top photo: Researchers (from left) Kim Ju-Song, Clive Oppenheimer, Kayla Iacovino and a North Korean geochemist on the shore of Lake Chon, in the caldera of Paektu.